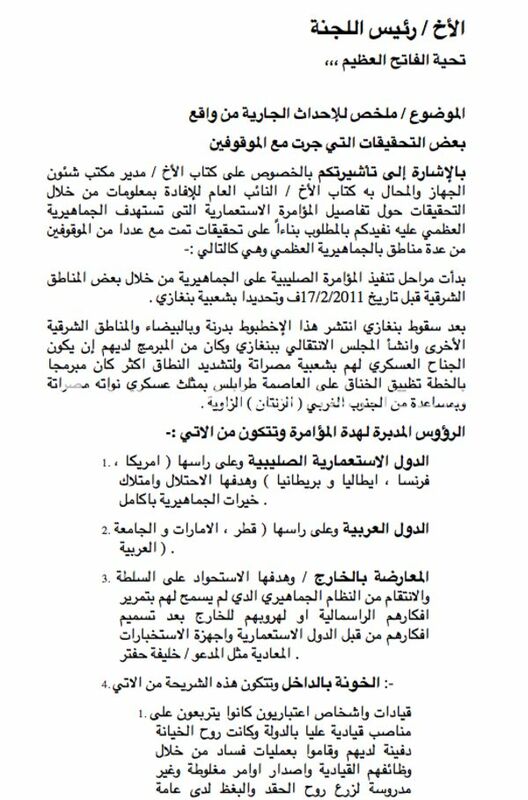 A portion of a lengthy undated document from 2011, that appears to be a report by a Libyan security official to a superior on the uprising against the Kadhafi regime in 2011. The subject "Summary of the current incidents based on investigations of detainees". The report says that what it refers to as the 'conspiracy', started in Benghazi on February 7, 2011, blaming it on what are called "crusader countries" including the US, France, Italy, and the UK. The report goes on to also blame Arab countries including Qatar, UAE and the Arab League, as well as external opposition and "internal traitors".